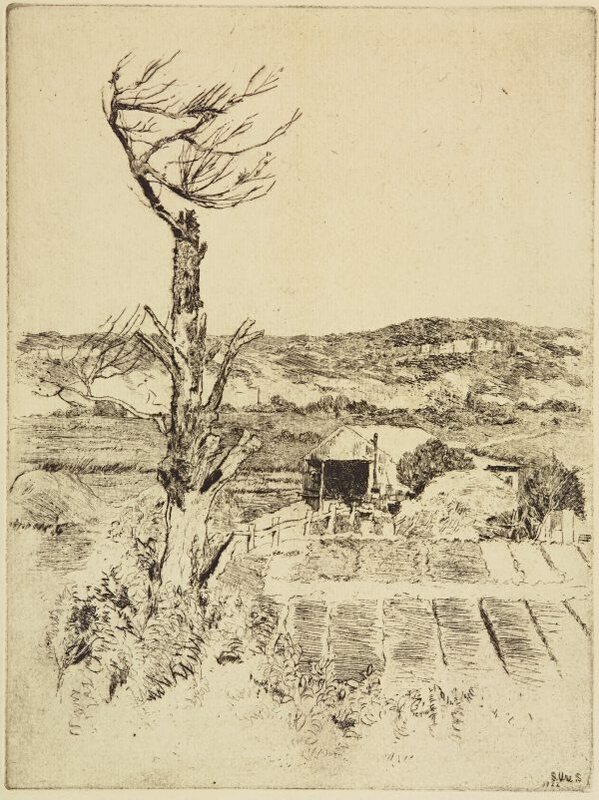 Sydney Ure Smith - artist, publisher and tireless promoter of Australian art - was a key figure in the etching revival in Sydney, not only as a practitioner of etching but also through his publications on the subject, including his magazine 'Art in Australia'. He made his first etching at the age of nineteen and was assisted in his efforts by fellow artists Eirene Mort and his good friend Lionel Lindsay. He bought Livingston Hopkins’ etching press to edition his work, eventually producing over 100 prints. Ure Smith was an active member of the Australian Painter-Etchers’ Society, exhibiting fifty-one etchings in their inaugural exhibition of 1921, and publishing a special edition of 'Art in Australia' to accompany the show. In 1925 he edited and published another special ‘Etching edition’ of the magazine, with an ambitious attempt to record a complete list of etchings published in Australia, with their date of issue and number of impressions. Sydney Ure Smith had a keen interest in architecture, particularly ‘old Sydney’ - areas like the Rocks, Windsor, and central Sydney that still featured the colonial buildings and haphazard streets of the nineteenth century. Many of these areas were under threat of demolition as the growing city developed, and Ure Smith, with others including Julian Ashton and Lionel Lindsay, recorded the older quarters of the city and their colourful street life, in part for nostalgia but also to advocate for their preservation. Signed and dated in plate to print l.r. "S.Ure. S/ 22". Helen Campbell, Look , 'Sydney Ure Smith etchings 1914-1934', pg. 30-31, Sydney, Mar 2017-Apr 2017, 30-31.